The 103-page plan in one word: ambitious. 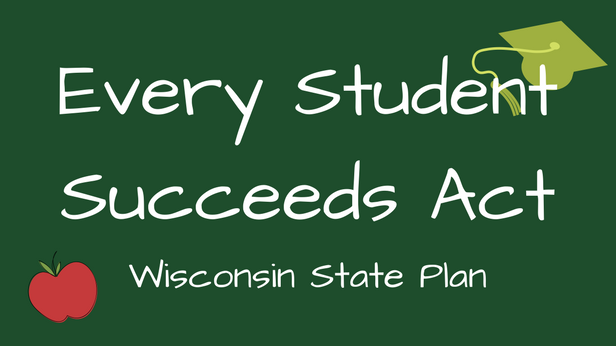 Wisconsin’s Department of Public Instruction (DPI) has released its state plan for the implementation of the new federal education law, the Every Student Succeeds Act (ESSA). The state plan is the culmination of over a year of work, including legislative briefings in the state Capitol and public hearings for stakeholders around the state. The document lays out new academic achievement goals and plans of action for Wisconsin’s students, including specific English language arts and mathematics proficiency goals. The state aims to cut achievement gaps by half over the next six-year period, with a long-term goal of closing the gaps entirely by 2029. That translates to an average 1 percent annual increase in overall student proficiency for both English and math over six consecutive years. Today, the four-y ear high school graduation achievement gap between white and black students is nearly 30 points. In math proficiency, the gap totals 38 points, and in English language arts, 35 points. The State of Wisconsin will submit its plan to the federal Department of Education by September 18. If Secretary Betsy DeVos approves the plan, it’ll guide state education policy for decades. The incredible significance of the state plan inspired one bill – Assembly Bill 233, currently moving through the Legislature – which may increase state legislators’ involvement in the final state plan. Overall, the state hopes to increase English proficiency rates to 48.3 percent by 2023. Currently, just 42.3 percent of students are proficient in English. In math, DPI set a goal of 47.2 percent proficiency by 2023, up from 41.2 percent. The current proficiency scores are based off of the Forward Exam, which students took for the first time in March of 2016. As a brand new requirement of ESSA, schools will begin publishing financial information, including per-pupil expenditures of federal, state, and local funds. That information will also include personnel and non-personnel expenditures, divided by source of funding for every school district and school in the state. According to the state plan, DPI must first build the infrastructure for this data – which will apparently take until the 2019-20 school year to first be published. Groups of students who are categorized as historically underperforming will have to post larger gains every year in order to meet the goals. Those groups – including racial and ethnic minorities, economically disadvantaged students, English learners, and students with disabilities – see the most ambitious goals in the plan. Black students, for example, must increase proficiency by 4 percent in English and by 4.2 percent in math each year if they are to meet the six-year goal. In English language arts, the achievement gap between Black and White students is currently 35.4 points. Under the state plan, the goal is for that gap to drop to 17.5 points by the end of the 2022-23 school year. Hispanic students will need to post annual increases of 3 percent in English language arts to reach the goal of 43.1 percent proficiency. Currently, just over a quarter of Hispanic students are reported as proficient in the subject. As for math, DPI set a goal of 45.1 percent proficiency, up from 21.7 percent. Students will have to increase by 3.3 proficiency points every year to reach the goal. DPI wants to see 90.4 percent of students graduating high school in four years by 2023. The current overall rate is 88.4 percent. In order to meet that goal, Black students will have to post the most drastic improvement and improve by 2.7 percent each year. Currently, just 64 percent of Black students graduate in four years, a nearly-30 point achievement gap with White students, 92.9 percent of whom currently graduate on time. For English learners, DPI hopes to see an 18-point increase in the percentage of learners on-track to reach proficiency by the end of the 2022-23 school year. That amounts to a 3 percent annual increase in proficiency, above the 2 percent annual increase required to meet Wisconsin’s obligations under the No Child Left Behind law. After six years, DPI will re-evaluate the progress made and potentially reset annual targets for the following six years. That setup effectively creates two six-year terms, which stakeholders decided would help convey the urgency of change needed, while also leaving time for school improvement measures to take root. In the plan, DPI acknowledges its goals to be ambitious for multiple reasons. Sustaining consistent improvement statewide will be difficult, though students have increased English language arts proficiency at about the same rate over the last five years. Improvements in math – which tends to be a more difficult subject for many students – have not been as consistent. While the goals are aggressive, they are also aligned with proficiency cut scores for the National Assessment of Educational Progress (NAEP). As a result, the college readiness expectations laid out in the plan are on track with national and international benchmarks. The state plan identifies two main kinds of schools that require additional support and that will be identified by DPI annually: comprehensive support and improvement schools, and targeted support and improvement schools. Schools that receive Title I, Part A federal funding and are in the lowest 5 percent of overall scores statewide are identified as comprehensive support schools. Other schools included in this category will be those with average graduation rates below 67 percent. Schools will first be identified in the 2018-19 school year using the most recent data available. The third type of comprehensive support schools will be those that fail to exit the targeted support status after six years. Those will be identified during the 2024-25 school year. Targeted support schools are those that have two or more “consistently underperforming” subgroups of students. The plan identifies chronic underperformance as average subgroup performance that chronically and consistently places a subgroup of students in the bottom 5 percent of the state in more than one indicator. No more than 10 p ercent of schools in the state will be identified as targeted support schools in order to help ensure that sufficient resources are available to those schools. It’s likely that many comprehensive support and targeted support schools will be in Milwaukee, where 25,000 students currently attend failing schools. Intensive reforms at those schools will likely be difficult – perhaps even stonewalled – as in the case of the Opportunity Schools Partnership Program (OSPP), the most recent attempt to reform the perennially troubled district. That saga involved a long summer of disagreement between the Milwaukee County executive, the new OSPP Commissioner, MPS itself, and of course, the Milwaukee Teachers Education Association. OSPP would have allowed a new commissioner, appointed by the Milwaukee County executive, to identify up to five of the lowest-performing schools at MPS and allow them to be run by new independent operators, in the hopes of increasing student performance. The plan came to an impasse when MPS was not included as a failing district on the state’s latest report cards, despite the fact that fewer than 1 in 5 MPS students are proficient in English, and under 15 percent are proficient in math. Under ESSA, however, states will be required to take action in both comprehensive support and targeted support schools. As written, ESSA allows states to identify additional statewide categories of schools. Wisconsin’s state plan does not do so. The plan describes at length how Wisconsin would take more rigorous intervention measures for schools that fail to exit the two support categories. It emphasizes the importance of intentionally and explicitly including representatives from all members of the community. The state may provide a team trained in implementation science to provide external program evaluation, as well as school-specific customized improvement plans. DPI’s state plan includes four strategies to address ineffective educators, based off of its ongoing equity plan. Those strategies aim to improve resources for school districts and schools, create a study of school climate factors, facilitate ongoing professional learning to address teacher skills gaps, and evaluation of teacher preparation. Other sections describe how Wisconsin’s DPI plans to address the education needs of historically underserved populations, such as migratory and homeless children. The plan now enters a public feedback stage that is open until June 30. There also exists a possibility that the state Legislature will play a more meaningful role. Assembly Bill 233 (AB 233) would require that a hearing be held on ESSA in both the Assembly and Senate Committees on Education. If any legislators raise concerns or questions to DPI at the hearing, DPI would be required to respond within two weeks. At that point, DPI would need to say whether or not it will modify the plan accordingly, and if not, why. AB 233 passed the Assembly Committee on Education on a 8-6 party-line vote and is scheduled to be heard by the full Assembly on May 2. It faces an uncertain future, as Senate Committee on Education Chairman Luther Olsen (R-Ripon) has said that he has “no interest” in holding a hearing on the bill.